And so Agamemnon Tselikas has finally published his Handwriting Analysis Report at BAR. As was previously known he thinks that the letter is a forgery and that Morton Smith forged it. His arguments for this were also mostly known before, although he now presents them more in detail. I probably will return to the report more in detail later on, but for the moment I will concentrate on the issue which might be more important than the rest of Tselikas’ arguments combined. For Tselikas has found some scribbles in the book where Clement’s letter to Theodoros originally was penned down, and he thinks that this is the same hand that wrote the Clement letter. Isaac Vossius’ 1646 edition of the Epistolae genuinae S. Ignatii Martyris, remained in the library after the pages had been removed from it. On page 11 Tselikas found some scribbles where the pen and the quality of the ink obviously were tested. I will take the liberty of using the image published by Tselikas. 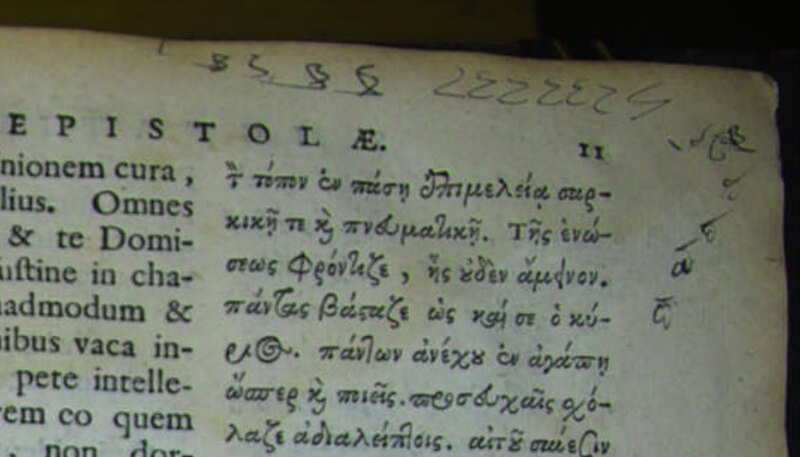 Tselikas publishes one letter pi from To Theodoros (reproduced to the right) and says that it “is impressive the similarity of the letter π with that of the manuscript” and that it “must be written by the same hand and ink.” Tselikas does not say from where he has taken his example, however it is taken from the word πρῶτον at 1.20. At first I got excited. What if this hand from page 11 in Vossius’ book actually is the same as the one who penned down the Clement letter and as Tselikas thinks also used the same ink? Then we could do a test on the ink and although we do not have the actually letter, we still might find out if the text was written in the 17th, 18th, 19th or 20th century. However, having studied the images more closely, I am far from certain that Tselikas judgment is correct. Of course I cannot challenge his expertise in this field, but the basis for his conclusion seems rather meager. Below I reproduce the 10 pis found in the first 10 lines of Clement’s letter to Theodoros, and which have the same loop at the top as the letter reproduced by Tselikas has. Since the example presented by Tselikas mostly look like scribbles, there is no easy way to find parallels. I suppose three of the four letter-like creations to the right of page 11 could be compared to the pis in Clement’s letter to Theodoros; and I reproduce them below, with the contrast slightly enhanced. And then there also seems to be an alpha, I guess. This however could not so readily be said to resemble the alphas in To Theodoros. There are of course a lot of alphas, but I have been unable to spot a single one which look like this alpha. Below I give some examples. The alpha (if it is an alpha) to the left from page 11 is, if not round, rather as long as it is tall, while the alphas in To Theodoros almost always are elongated. There are of course a vast number of alphas in the letter and although I checked it in its entirety, I might of course have missed a few. Still the examples above are very representative and the alphas which most closely resemble the alpha at page 11 are the ones in the image below. These are the second alpha of the word μωρανθῆναι at 1.15 and the alphas from the words μία at 2.23, ἵνα at 3.5, οἰκίαν at 3.6 and νεανίσκου at 3.15. Besides that they still look more elongated, they also lack the vertical pin sticking up above the circle as it does on the alpha at page 11. So even though there might be some fairly close parallels, these parallels would still be exceptions. The rest of the scribbles are difficult to compare. There are a few B’s (two of them reproduced to the right), but they have no correspondence in To Theodoros. I would say that a statement by Tselikas that this text is written by the same scribe who penned the Letter to Theodoros of course is possible (and perhaps even probable), but the basis for his judgment seems to be poor and ambiguous. I am afraid that even if we could test the ink and it would give us a fairly secure result, we still cannot know if Clement’s letter to Theodoros was written at the same time by the same scribe; unless there is some other information unknown to me. If Agamemnon Tselikas claims the scribbles “must be written by the same hand and ink.”, then we have here, at last, a claim that can be tested whether it’s true or false. So I think you should still be at least a bit excited, Roger. If it can be shown that Mr. Tselikas has drawn an incorrect conclusion (that the Clement letter is a forgery by Morton Smith) since the ink, maybe, can be shown to be much older than Morton Smith, then this paves the way for a new debate, namely: Are the scribbles and the Clement letter really written by the same hand? I must say I like conclusions that are possible to falsify. Like you did when you showed that the so called ”forger’s tremor” was not a tremor at all but instead a result of using and analyzing photos with a low definition. This is what is so frustrating in this whole mess. Instead of spending the time and effort to figure out where the manuscript is or what happened to it, Tselikas seems intent on lecturing and explaining why it is that we should ignore the manuscript. This is why the arguments tend to contradict one another. The document was probably destroyed or lost and now the public face of the monastery just wants to come up with reasons why this shouldn’t upset anyone. The reality is that the testing of the ink that appears on p. 11 is our best shot of figuring out whether or not someone wrote in the book before 1958. I just can’t figure out a way to allow to use science to help determine what the truth is. Upp med hakan Roger, om jag vore i dina kläder så skulle jag försöka ta reda på vart brevsidorna tagit vägen. Vi vet ju att det måste finnas i biblioteket kanske förlagts eller hamnat bakom någon hylla! Vad du kan göra är att skriva ett brev till sekreteraren och förklara att en kollega till dig (beskow)fått tillstånd av patriarken att titta på handskriften men när han kom dit fick han höra att brevsidorna besprutats just då och därför inte kunde undersökas, och att känner till att brevet försvunnit och att du vill göra något innan brevet försvinner eller förstörs för alltid. för om brevet finns där kommer du få tag i det. Det kan vaa värt ett försök.Du har ju inget att förlora.